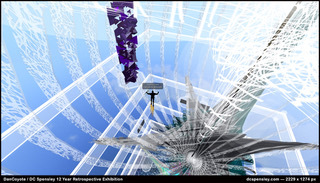 Welcome to a 12-year retrospective exhibition, presenting artworks created as my avatar, DanCoyote Antonelli in the social, virtual work of Second Life. 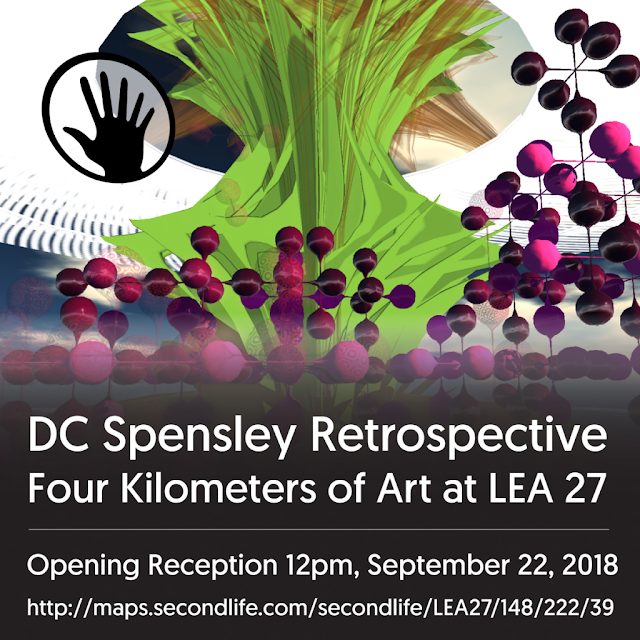 Sincere thanks to Linden Lab and all the patrons, collectors, collaborators, artists, composers, performers, and engineers who generously contributed to my artistic practice over these years. Rather than arranged in chronologically order of creation date, the artworks are grouped within themes explored over the years, in asking the overarching question: What does an art practice “native” to virtual worlds look like? This theoretical construct is what I call Hyperformalism. The three main types of artwork in this exhibition include Interactive, Aesthetic, and Performative. 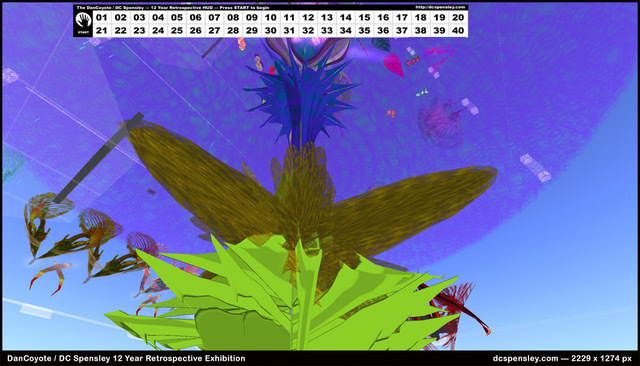 Interactive works implicate the viewer into the piece, making them the artist. With aesthetic works I attempt to conjure beauty within the virtual space. Performative works include documentation of live theatrical productions with as many as a dozen real-time ensemble performers. The virtual space housing this exhibition at LEA 27 is a rectangular volume, 256 x 256 x 4096 meters, called a “sim” or simulation. This sim is divided into 40 numbered “decks” accessible via direct teleport (on the DC HUD) or various chairlifts designed to enhance the journey. The featured 4.5-kilometer “Tower of Light” artwork inhabits the central axis of the sim, from top to bottom. Each deck serves as a pedestrian walkway with numerous octagonal platforms that give focus to the artworks and complete the viewer experience by providing 360-degree access, allowing each level to be viewed from any angle. Info signs reveal the titles and brief descriptions of artworks, which often require interaction with viewers to be complete. At level 00 visitors will find a chair lifts and a kiosk to pick up a free “DC HUD”. Take a chair lift to fly through the installation or “wear” the HUD to page through a catalog and teleport directly to one of 40 levels. Visitors should be aware that most of the scripting in this installation is available as open source. If you see something you like/need, please send IM to Dancoyote Antonelli with your request. This is not commercial software so no “support” per say is offered or inferred. Use at your own risk for non-commercial purposes. Cheers! And Thank you for visiting!